To be in Lake Como over the Easter holiday weekend felt like many other Easters, as far as the symbolic value. I don’t find it wholly natural to “celebrate” any day based on beliefs external to my identity. Objectively I love church architecture, spring weather, good food, and the day off from work/school, but Easter is just another day. Never say this to an Italian, though. Nonetheless, my dad was raised Catholic and felt it handy to make a second visit to me in Italy over our long Easter weekend off from classes. Instead of staying in Milano, he rented a house on western Lake Como, in the whisper quiet village of Acquaseria, about an hour north of Como citta. Just like Tuscany, Provence, and the Mediterranean, this region is rich with tradition, pocket villages, and an abundance of tranquil beauty. While relatively remote, our accommodations were modern with a rustic edge. We parked along the historic hillside housing cluster and walked to our neatly-tucked rental flat along narrow walkways and up cobbled steps, past ancient water fountains and more than a few Madonna shrines. If you’ve never seen the lakes of Northern Italy, a spit away from the Swiss border, you can’t imagine how different they feel than any standard lake. They’re glacially-formed, meaning they’re very deep, very cold, and tend to be long and thin rather than rounded, crater style. Lively, vocal groups of mallards and swans can be found all over the shores of this historic formation. Acquaseria was our charming no-frills resting place, as we sought solitude over crowded streets and gelaterias that one finds elsewhere around the lake. 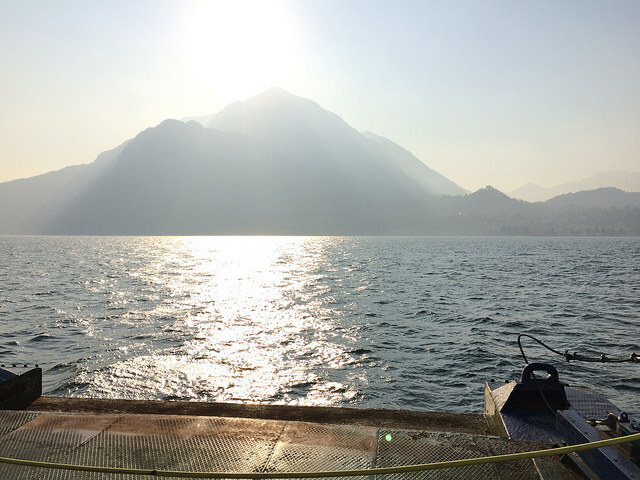 We did take the ferry from Menaggio to Bellagio and Varenna, both of which are larger and busier, on opposite points from our village. Boats carrying people, cars, bikes, and motorcycles crisscross Como frequently, so daytime pranzo outings are simple and easy. I found it strange and funny that the circuitous navigation around the lake, major views up to Alpine mountains and down to the crisp waters, tiny perched towns, and our particular accommodations akin to a mountain cabin, felt so much like our family’s time over the years in Cullowhee, North Carolina. Appalachia lacks glacial formations, but the simplicity of life in these places and precarious conditions of driving reminded me more than once of spending Christmas atop a mountainous gravel driveway, away from much beside wildlife and trees. What’s more, though rural Western Carolina has few if any ancient villages accessible only by footpath, the parallels between life in the mountainous woods and that in a hillside medieval village are more numerous than you’d think. The compactness of Acquaseria, and many thumbprint spots on the Italian map, is fascinating. That almost every house, along with cow, sheep, and tomcat, has a view of the waters of Lake Como is breathtaking. Lugano, Switzerland is actually closer to Acquaseria than the city of Como is, so the day after Easter we drove across the border and had lunch on Lake Lugano, which feels eerily like being in Zurich. Being so close to Italy, this part of CH is heavily influenced by its neighbor, without the its chaotic Latin flair. And no graffiti. All scrubbed clean and orderly. I particularly liked the concentrated shopping on Via Nassa…Antonioli (outpost of Milanese multi-brand store), Prada, Bally, Vuitton, Hermès, Cartier, etc. All closed on Monday after Easter, but I enjoyed the windows. Our last day at the lake dad’s friend Susan arranged for us to cook with a professional chef and author of a cookbook, Paola Lovisetti-Scamihorn. I plan to write a separate post about her and cooking what I would define as Italian light fare, as we have become casual friends via Facebook since our afternoon at her family’s home. If Easter is about relaxing and reconnecting with family, then it was a great one this year. Lake Como is unlike any other place I have been, though I hear it looks similar at moments to Lake Tahoe in California and Nevada. After too long I would grow bored being so secluded, but for a few days, and especially for Dad and Susan, it provided a needed respite from harried travel, urban drivers of Milano, and the crush of foreign tourists so omnipresent in modern Italy. What a lovely place to spend some days off with the fam! A gorgeously memorable trip and visit. And your storytelling becomes more elegant, if that is possible. And I can’t wait to catch up with you, albeit electronically. I’ll try to email this weekend. Cheers!